You are here: Home » The Wisdom » The Great Speech » 165-As the first duty of the Assembly that "the prescriptions of the Sheri should be put into force." The putting into force of the prescriptions of the Sheri,” cannot and are not intended to express anything other than the “prescriptions of the law. I was myself in the chair when the first Constitution Act was drafted. Many attempts were made to explain that the expression “prescriptions of the Sheri” had nothing whatever to do with the law which we were drafting. But it was impossible to convince those who, guided by a wrong conception, attached quite another inter pretation to this expression. I must confess that it was most undesirable that I should have to answer this question, because, in the circumstances then prevailing, I did not wish to be compelled to give an answer which was evident incidentally, a very short one. If a State having amongst its subjects elements professing different religions and being compelled to act justly and impartially towards all of them and allowing justice to prevail in its tribunals equally towards foreigners as well as its own subjects, it is obliged to respect freedom of opinion and conscience. It is surely not justified in making restrictions in this natural authority of the State by attributing other qualities to it which are capable of having an ambiguous meaning. When we say that “the official language of the State is Turkish,” everybody understands what this means; everybody understands that it is natural that the Turkish language should be used in official affairs. But will the sentence “The State religion of Turkey is the Mohamedan religion” be accepted and understood in the same way? It must naturally be criticised and explained. I immediately felt the need of commenting on and qualifying my answer by the following sentence: “The Mohamedan religion includes the freedom of religious opinion.” Thereby I wanted to express that the State is obliged to respect freedom of opinion and freedom of conscience. I wanted to end the debate, but this was not possible. At that time I was thinking of two things. Will not every grown up person in the new Turkish State be free to select his own religion? The first was: Will not every grown up person in the new Turkish State be free to select his own religion? But to quote the words of the Hodja would be equivalent to an attempt to abolish the national sovereignty. But, on the other hand, we had not to consider the bulk of the knowledge of the Hodjas comprised in formulae which had been dictated in the time of Caliph Yesid*) and which had been appropriated to a regime of absolutism. Consequently, who would be deceived if the expressions “State” and “Government” were enwrapped in the cloak of religion and the Sheriade? Although the meaning of these expressions, as well as of the authorities of the Assembly, are now clear to everybody,what need is there for this deception? This was the actual truth; but I did not wish to discuss this sub ject any longer with the journalist on that day at Ismidt. *) Caliph Yesid I, 680-683 is probably referred to. of the Act, which deprived this Article of any sense. And this was done with the intention of not playing into the hands of those who are only lying in wait for a pretext to give the expression “Govern ment of laymen” the signification of being hostile to religion. 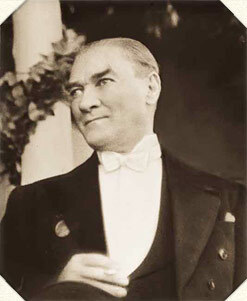 The superfluous expressions which were incompatible with the modern character of the new Turkish State and our republican regime, contained in Articles 2 and 26 of the Act, constitute compro mises to which the revolution and the Republic ought to have agreed, so as to satisfy the exigencies of the time. When the first favourable opportunity arises the nation must eliminate these superfluities from our Constitution Act.